Emergency Roof Repair Call Center: 24/7, 365 Days Per Year. Bloom Roofing's emergency roof repair call center is monitored 24 hours per day, 7 days a week, 365 days a year. Simply call us at 800-483-9932 to talk to someone in our service department immediately. We will put a commercial roof repair plan together immediately to handle your leak or roofing emergency. Need Commercial Roof Maintenance? Learn about a simple cost-effective program provided only by Bloom. This program provides businesses and property owners a more cost-effective way to proactively and reactively manage their roofs. Most industrial and commercial roofing companies will simply react to your call about a roof leak; drive to the site, fix the leak, and leave. At Bloom Roofing we know the current leak may not be the only area of concern on a roof and believe that there is a better way. A proactive approach to industrial and commercial roof repair can make the most of your maintenance dollars by finding and correcting potential problems before they manifest in roof leaks. 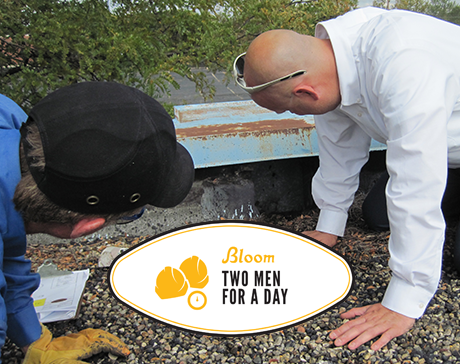 Contact us today and invest in preventative commercial maintenance with our Two Men For A Day Program, exclusive to Bloom Roofing. 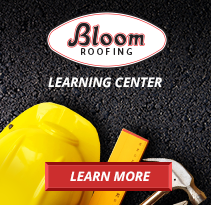 At Bloom Roofing, ongoing training and development of roofing technicians and high internal standards for employees are two of the many reasons for our success over the years. 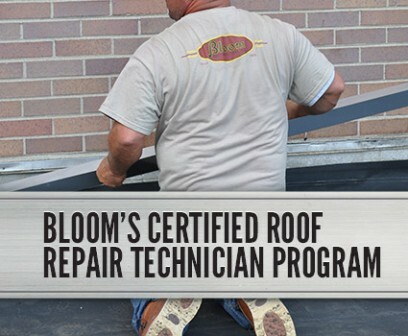 Bloom's Certified Roof Repair Technician Program was designed to improve the roofing knowledge, expertise, and customer service skills of all of our technicians. Though such programs are not required by the commercial roofing industry, our high internal expectations have helped us become one of the most effective commercial roofing companies in the midwest. This belief in quality helps us hire and retain some of the best and brightest roofing technicians in Michigan.